The first book for an emerging author is a monumental thing. The build up to launch day is a bundle of excitement and expectation. The recent Facebook posts of debut author Michelle Wanasundera, have been a joy to read, as she primes her beautiful new ‘book baby’ for launch into the world. This new book bub is Bubbles and Puddles, with poetry by Wanasundera and illustrations by interior designer and children’s book artist Thana-one Yazawa. Reading Michelle’s bio puts her book into perspective. She lives in the Blue Mountains with her family; the most perfect place to indulge a love of nature and creativity. Career-wise, Michelle has studied psychology, philosophy and children’s meditation. These skills infuse her writing, with insight into how a child’s mind works and an endless appreciation of the calming wonders of the natural world. 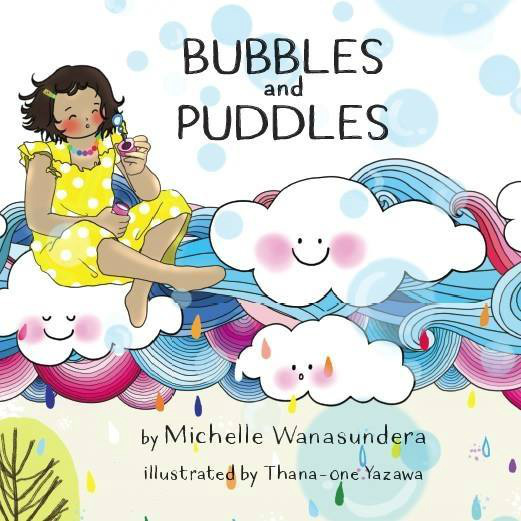 Published in glorious hardback, Bubbles and Puddles makes a statement with its visually -leasing balance of rich colour illustrations and white text backgrounds, for its blocks of poetry. The publication’s design is striking and reminds me of those books from childhood that I wanted to retain as keepsakes, to dip in and out of at my reading leisure. The picture books that impacted me as a child were often anthologies of poetry, fairy tales, nursery rhymes or Aboriginal legends but publications like this almost seem to represent a dying art. It is therefore wonderful to see this genre making a comeback with books like Bubbles and Puddles and Magic Fish Dreaming by June Perkins, to name just two. With scope for classroom and library readings and helpful ‘Teacher’s Notes’ for each poem, this dreamy verse collection is grounded in an understanding of child psychology. It deals beautifully with issues like childhood anxiety (Belly Bubbles) processing big emotions (Waterfall), as well as appreciation for giving to others (Rainmaker) and allowing yourself to ‘be’ in the moment (Little Lights). Wanasundera is a talented poet and while she has a good command of rhyme, also employs free verse, which keeps the collection from falling into any sing-songy traps that would undermine the importance of its messages. Every full-page illustration is a celebration of the poetry within and I hope that Wanasundera and Yazawa continue their partnership which is seemingly a match made in heaven. The Poo Book Blog would heartily recommend this collection of holistic poetry for sensitive and creative children, of primary school age. Keen readers ages 5-6 will need their parents help and there is a lot of text, so breaking it down to one or two poems before bed, may be the best way to foster appreciation and a love of repeat reads. For middle-primary readers, able to read independently and developing an interest in poetry, this book is the kind I can see them reaching for frequently, depending on their mood and which poem resonates on any given day. The dream-like illustrations (which conjure up fairy tales of yore), are pure escapist joy and will help ensure this book’s long shelf-life, along with the heartfelt verse, which pays tribute to the way the author’s daughter, Amali, views the world. Congratulations to the Author/Illustrator team on the soon-to-be launch of Bubbles and Puddles and I look forward to seeing the book’s buddy, Hugs and Bugs. Follow Michelle on Instagram at michellewanasunderaauthor.